This Penny Slider Tutorial will show you how to reproduce this lovely card for your self. This card is sometimes referred to as the Penny Roller and it is the card that will cost you all of 2p...to do the mechanism that is. It is one of those designs that has great fascination for children as they like to roll the pennies from side to side. 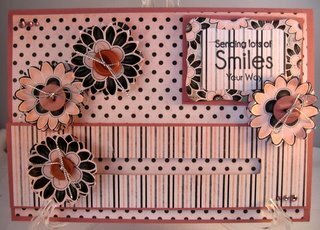 The paper for this Pink and Black card is from the "Bubblegum and Licorice" collection from Summertime Designs. It is one of many collections that Summer produces and it is a Freebie. 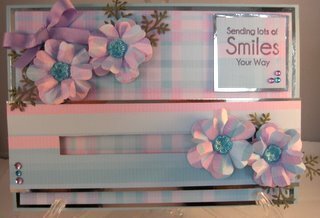 The card itself is one of several lovely Kinetic Cards and all have the full instructions on how to make them. Many are in the process of being turned into video tutorials for those who prefer to watch. But if your preference is to read then you will find also the Written Instructions. All the videos are short and easy to follow and will make things crystal clear and you will find the instructions to make the flowers here. It isn't difficult to do and I am sure that both you and the recipient will love the finished result, and it can be for any occasion and will suit male and female. Just check that the mechanism works before you send the card or the children will be very disappointed!! !